A weekly weigh-in and general health and behavior check is a good idea. 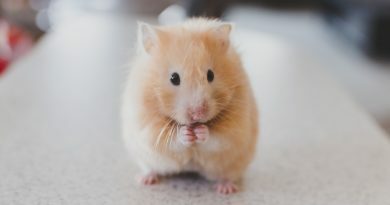 Behavioral signs of ill health could include not walking or playing properly, or, if it is sick and irritable, your hamster may bite more. The nose should be clean and dry, the eyes bright and free from stickiness (Sticky eyes can indicate conjunctivitis.) Hair loss could be a sign of protein deficiency or that their bedding is irritating them or that they have become bored and so are rubbing against the side of their home. If it looks as though their skin has been irritating them, this could also be a sign that your furry friend is playing host to a parasite such as skin mites, ear mites or ringworm. Greasy fur could be a sign that bedding is not being changed often enough. 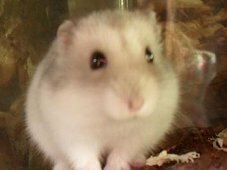 If your hamster is sneezing, wheezing or seems to be finding it hard to breathe, you first step should be to think about what kind of bedding you are using. Avoid cedar shavings as they can bring on respiratory difficulties. Otherwise, seek veterinary help as soon as possible. The growth of nails and teeth needs to be kept in check. Wooden toys keep nails trim, and your pet needs to gnaw on blocks, sticks or toys. Check that teeth are a good length, and not chipped or misaligned. If your pet seems to be losing weight and not eating, dental problems could be the underlying reason. Equally, a broken tooth could be a sign your pet needs more calcium. It’s important to get the balance right in your animal’s diet. Too much fruit and greens and it will get diarrhea – too little and the little creature will become constipated. Too many greens can also cause wet tail, a highly contagious bacterial infection which causes diarrhea, especially in younger animals. 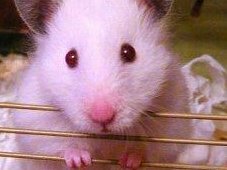 Your hamster will have a sticky bottom and tail, and appear to have stomach ache, since it will probably hunch itself up. Isolate infected pets, and be fussy with hand washing and cage cleaning after handling. Glaucoma affects the eyes, which will look much bigger than normal. Glaucoma increases levels of fluid within the eyeball, leading to loss of vision. The hamster will rub its eye and it may even enlarge so much that it prolapses from the socket. Hamster glaucoma can follow rough handling, fighting or being held too tightly from the scruff. While there is no specific treatment, your veterinarian can prescribe painkillers. Although glaucoma can mean your hamster will lose its sight, it already has poor eyesight to start off with, so this doesn’t have to be a huge problem. However, you should not breed from hamsters who have glaucoma. While dwarf or Siberian hamsters and their Syrian cousins can experience most of the same health problems, as outlined above, diabetes is more common in dwarf hamsters. Stress, a sugary or fatty diet and unclean living conditions can trigger this problem, which is also thought to be genetic. Your pet may sometimes tremble, and drink and urinate excessively. Exercise is important in helping prevent diabetes, so make sure your dwarf hamster has a ball or wheel to play with.